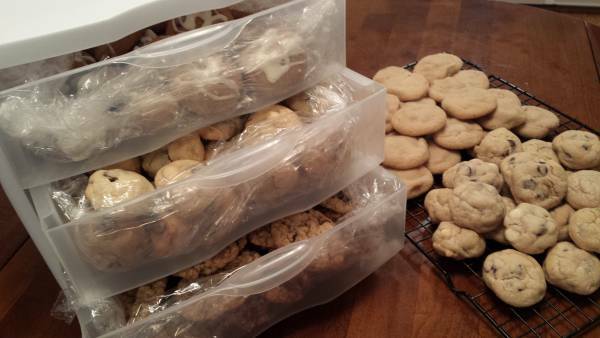 This morning (and late last night) I made five varieties of cookies. Chocolate chip, oatmeal raisin, molasses crinkles drizzled with white chocolate, peanut butter and white chocolate chip with craisins. I’m bringing cookies to work, as usual, but I’m also making them to take to a special occasion. Hundreds of school children are expected to pour into the Coach TB Thomas Sports Center in Hartsville this afternoon. I hope they’ll pour in, running at full speed would be great, and that they gobble up my cookies quick as a wink. I don’t remember most of what I did in grade school, but I remember being reminded often (nagged, is how I remember it) about not running to the buses. I ran to everything. Why wouldn’t I run to the buses? Once, I remember slowing down to an obedient “fast walk” and grumbling to myself that I hoped I’d never be so old that I didn’t want to run. I still feel that way. I don’t actually run as often as I’d like, but it’s fun — exciting — to run furiously or just make a quick dash. It’s one of the lessons I learned in school that I still treasure today. DaVita Malloy called me last week to see if I’d be willing to participate in the local Back-to-School Extravaganza, a fall event she puts together (with help from friends all over town) to encourage students to do their best in school. Now that’s a cause I want to back! …an afternoon party to let young people know that these next months — these school months — are the ideal time to learn and take on new challenges. In my book that includes running physically and emotionally. Go all out, full bore, just as fast as humanly possible. If your heart is in it your mind won’t be far behind! I want to tell children to try their best, do well, enjoy their learning, and when they’ve exhausted themselves and opportunities in school, I want to encourage them jump into college and keep on learning. I want to reward those feverish back-to-school dreams, every one. I recognize that Friday cookies aren’t a healthy choice, and I know (sort of) that it’s often prudent to walk instead of run. But I also believe that a cookie made from scratch on a perfect Friday morning, for the purpose of encouraging a smile and starting a conversation, offers a peaceful pleasure. They do for the cook, for sure, and I hope they do for the eaters. I am grateful for the people who kept me safe and for the ones who demanded that I look squarely at things so that I could discover important lessons about patience and planning and delayed gratification. But I adore the ones (like Mrs. Hanson) who did all they could to get me to try my best. ← A Near Miss and More Math Than is Appropriate for this Cook at 5 a.m.